Tour Description: Beijing airport pick-up upon your arrival, and then drive about 1.5 hours to the the Badaling Great Wall, which is the most famous and best-preserved section of the Great Wall. Stay as long as you can on the Wall. Then transfer to the old Hutongs to experience the life of Beijing ordinaries. You will take an interesting rickshaw trip through the narrow alleys and courtyard houses, pay a visit local Hutong family and visit the Drum Tower, etc. After tour, return to airport to catch your next flight. End of our service. Thank you for using our service! Hi! Going to the Philippines summer of 2018, we check flightts that has long layover (12hrs). If arriving at the airport at 10am, whats the best tour do you recommend, of course our top list is the great wall, can we still do the forbidden city? It will be a private tour since there’s 5 of us. And also will my husband be needing a VISA, he has a Phillipine passport but he has a US Green Card. Me and my kids are US citizen, do we need a VISA also? According to your layover time, you will have enough time to visit the Great Wall and Forbidden City. We arranged many tours for Philippinese without visa. But the airport have right to stop you in the airport without any reason even was happened for the US passport holder. So if you want to be 100% sure, please apply for a visa. We just sent you an email about detailed tour itinerary and price, please check it out. we have a layover in Beijing on february 25th. Our plane arrives at 11:45 and our next flight is at 01:05, so we have round about 13 hours. Is it possible to do Great Wall and Forbidden City or are we arriving too late to do both? Since the Forbidden City stop entering at 15:30 and the Great Wall stop entering at 16:30. 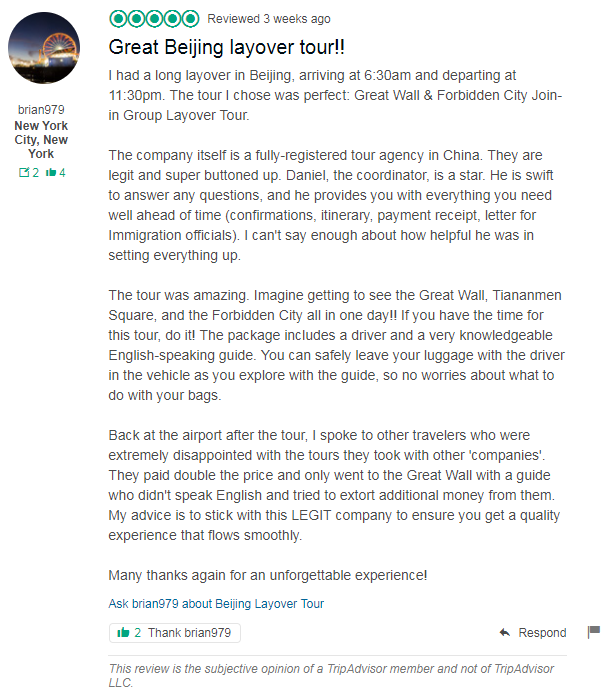 So I do not think you can visit both of Great Wall and Forbidden City during your layover in Beijing. I recommend you visit Great Wall and Hutong or Great Wall only this time. We just sent you an email about detailed itineraries, please check it out and let us know your idea. I am interested in booking a tour during my layover on 10 July 2016. I will be arriving in Beijing at 1515 and departing the next morning at 540. Which tours are possible during this time? Since your arrival Beijing time is too late. The Great Wall will be closed by then. I recommend you visit Hutong & Tiananmen Square. We just sent an email to you, please check. Hi there, I am interested in the Great wall/Hutong tour on May 14th. I arrive in Beijing at 6am and leave at 9pm. What are the individual prices and is there availability on this day? Thank you. Yes, you can do this tour on May 14th. We have sent an email to you, please check. What is the price for the tours. I cant find it anywhere on the website. 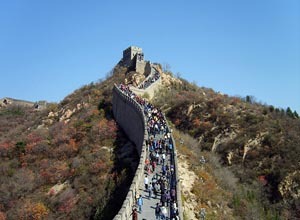 I am interested in an 8 hours tour to the Wall and Forbidden City. Our travel advisor has sent an email to you, please take a look. Hi how much is the price for two for badaling Great Wall? I have a 15 hour layover in Beijing. If you would like to visit Badaling Great Wall only, please see details at: https://www.beijinglayovertour.com/badaling-great-wall-layover-tour/. I would like information about the airport-to-badaling-great-wall-hutong to airport tour for two. Question #1: do we need visa’s, #2: we will have an 11 hour layover (December 14 roughly 6am – 5pm), would this be feasible ( is the 8 hours entire round trip)? #3:Any other information we should know. According to your flight times, you will have enough time to do this tour. About Visa-free policy, please see details at: https://www.beijinglayovertour.com/visa-free-policy/. We have sent an email to you, please check. Hi, please can you give me any further information for the tour for two of us(times/price etc). We arrive 27th July at 6.20am and do not depart until 7.30pm therefore this trip seems ideal. No problem. We just sent an email to you, please check. Thank you!